Shabbat meals are perfect for sharing. Many of us invite guests and have the opportunity to be guests for Shabbat meals. Unlike our grandmothers, who sat down and ate what they were served (BTW, I have my doubts about this) most of us have specific eating habits that we are attached to: we are vegan, we are allergic to certain type of foods, we are following a specialized eating plan, etc. All these different eating styles can make it stressful when you are a guest at a Shabbat meal! On the one hand, you want to be a good guest and at the same time you want to be able to eat the foods that make you feel well. If you want to be a respectful guest and be able to adhere to your eating principles, the best thing to do is to tell your host in advance about your food preferences and offer to help him/her cook. You can send an email like the one below in advance. If they’d like, we have a phone conversation about the content after they’ve read it so they can ask questions. 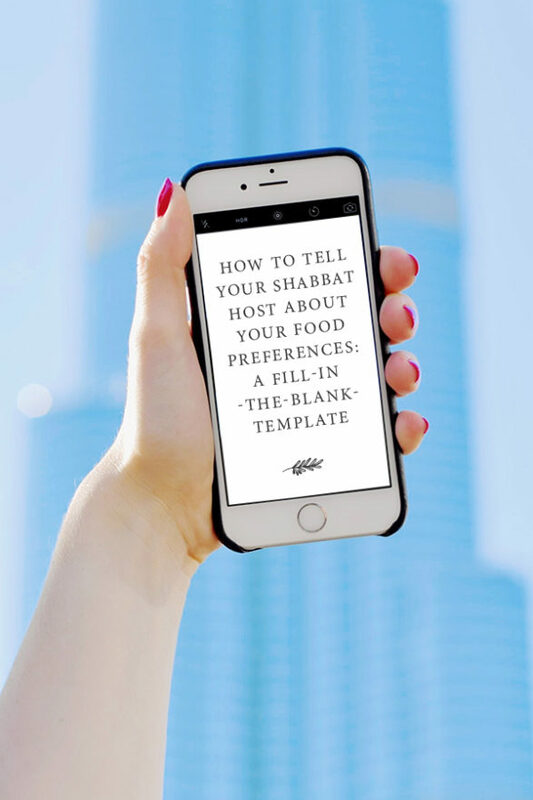 This front loading of the particulars and offer to help can eliminates uncertainty and worry on their part – and allows you and your host to relax and enjoy our Shabbat meal together. Thank you for the Shabbat meal invitation. I’m so looking forward to coming for Shabbat. I wanted to let you know about my eating habits in advance. I currently eat (tell your host how you eat here) and/or I am allergic to (tell your host which specific foods you are allergic to here). What this means is that I don’t eat (indicate the foods that you cannot eat here). However, I do eat all kinds of (indicate the food groups that you do eat here). I’m sharing this information with you so that you can ask any questions you’d like ahead of time, and so food stress does not have to take center stage during your Shabbat preparations. And, know that I respect your personal eating habits and don’t expect you to adhere to mine during Shabbat. .
Let me know how I can help and make this easy for you. Your turn: Share your best tips on how to tell Shabbat hosts about your food preferences? Next What Is Your Pantry: Sabrina Perl?